Rabies is a progressive and deadly viral disease that affects the brain of carnivores and bats, primarily, although any mammal can be infected. Small mammals such as squirrels, rats, mice, hamsters, guinea pigs, gerbils, chipmunks, rabbits, and hares are almost never found to be infected with rabies, and have not been know to cause rabies among humans in the U.S.
Rabies is transmitted through saliva and brain/nervous system tissue, and this almost always occurs through a bite from an infected animal. There is some thought the virus may rarely spread through mucous membranes (eyes, nose, mouth), and there are 11 human cases that occurred from organ transplants (corneas and solid organs). The high-risk carriers in Texas are bats, raccoons, skunks, coyotes, and foxes. However, the U.S. sees between 80 to 100 dogs and more than 300 cats with rabies each year. In foreign countries the number-one cause of human rabies is dog bites, with monkey bites coming up second. Rabies has the highest case fatality of any infectious disease. Annually, in the U.S., 1 to 3 people die from rabies, however the numbers are staggering worldwide: over 60,000 people die each year. If you are bitten by a mammal, it is important to wash the wound thoroughly, seek immediate medical assistance, and report the bite to the local rabies control authority. Once a person begins to exhibit signs of the disease, survival is rare. To date, less than 10 documented cases of human survival from clinical rabies have been reported. In the U.S. rabies vaccination is key in preventing disease in our pets. 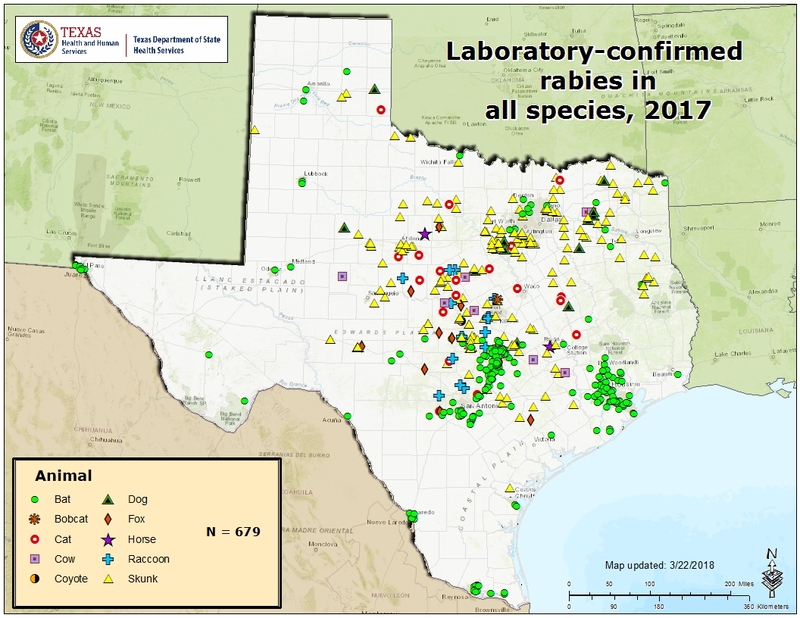 In Texas, dogs and cats must be vaccinated against rabies by 4 months of age, and follow-up boosters are required. Although not required by law, it is recommended that livestock (especially those that have frequent contact with humans), domestic ferrets, and wolf-dog hybrids be vaccinated against rabies. For more info when traveling to foreign countries. To report a bite case in Texas. If you have additional questions about rabies, dog vaccinations, or cat vaccinations give us a call at 281.351.7184 or contact us at kindvet.com.